The Hindu Thaipusam Festival festival is a public holiday in Malaysia and takes place every year end of January / beginning of February. The spectacular Thaipusam Festival draws more than one million devotees and visitors to the Batu Caves near Kuala Lumpur but there are also large precessions in Georgetown/Penang and Singapore. Thaipusam is a Hindu festival celebrated mostly by the Tamil community. Especially images of devotees piercing their cheeks, tongue, face or other suitable body parts with sharp objects make this event memorable. Thaipusam is a celebration of the birthday to the Hindu deity Subramaniam. The highlight of this celebration is the kavadi procession. 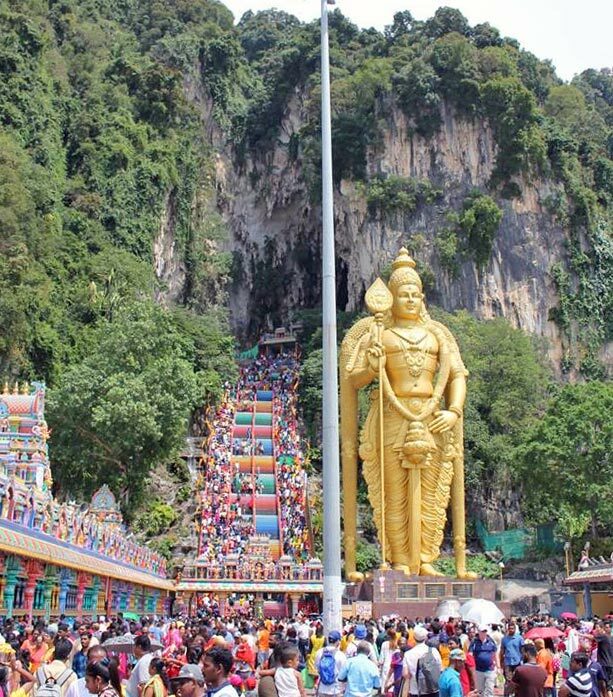 More than one million people are expected to throng Batu Caves (just north of Kuala Lumpur) for this celebration. There is also a big parade in Georgetown, Penang and Singapore (procession is a 4km walk from Sri Srinivasa Perumal Temple in Serangoon Road to Sri Thendayuthapani Temple on Tank Road). The date of Thaipusam fluctuates and always takes places either end of january or beginning of february.